Robert Caro discusses his latest installment on the life of Lyndon B. Johnson. I’m Richard Heffner, your host on The Open Mind … and when my guest today joined me at this table for the first time nearly three decades ago, I took particular note then of both Thomas Carlyle’s comment that “the history of the world is but the biography of great men” and Ralph Waldo Emerson’s that “there is properly no history, only biography”. Now, whether he would or would not agree with Carlyle and Emerson, I believe that Robert Caro has more than demonstrated their correctness in his own great works: in The Power Broker – Robert Moses and the Fall of New York, and in his thus-far four volume masterpiece: “The Years of Lyndon Johnson – Volume 1, The Path To Power; Volume 2, Means of Ascent; Volume 3, Master Of The Senate – and now Volume 4, The Passage of Power. 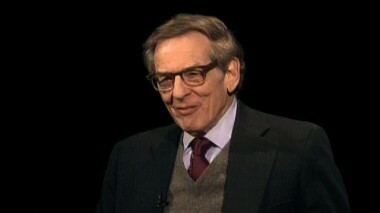 And Robert Caro’s repeated awards: his Pulitzer Prizes, his Francis Parkman Prize of the Society of American Historians, his National Book Award, his Gold Medal in Biography from the American Academy of Arts and Letters…and the many other honors my guest has received since he long ago broadened his journalist’s perspectives, only make us all the more eager to embrace what presumably will soon be the final, fifth, volume of The Years of Lyndon Johnson. Meanwhile, today’s program is only the first of a series of Open Mind conversations about Volume 4 of The Years of Lyndon Johnson: The Passage of Power. And this time — much to his relief, I’m sure — I’ll not implore my guest once again to hurry up with his next volume out of respect for my advanced years and my great eagerness to know before I pass just what final judgment he will pass on this bigger-than-life American. For I think I now know … and I wonder if my guest hasn’t been giving much more than hints to his readers all along. Bob, you think you’ve been throwing out more than hints to your readers about your final conclusion about Lyndon Johnson? CARO: I … no … I don’t think … I, I don’t think I’ve been throwing out hints. I say at the end of this book … you know, which of course, is in many ways about Lyndon Johnson’s finest hour, when he takes over the Presidency … on no notice at all … when Jack Kennedy is assassinated … and has to solve a lot of problems and bring the nation through what could have been a crisis … wasn’t a crisis … more of a crisis because of him … but I say at the end of this book … but this is not the whole story of the Presidency … Vietnam is yet to come. So, if that’s a hint, but it’s also … that’s just the fact. HEFFNER: To me, I wouldn’t expect you to say anything other … or write anything other than the fact. But I then I realized, Bob, that going through the four volumes over these years and I’ve read them, each one of them … I realize I go up and I go down and I’ve come to the conclusion that Caro is judging Lyndon Johnson in this wonderful even-handed way, saying, as we should say about all men … “that there were good things and there were bad things”. HEFFNER: Dark stream that runs through every man’s life. CARO: Yeah, well that’s a great compliment to me. I, I take it as a great complement that you say there are great ups and great downs because I’m … the hardest thing about writing about Lyndon Johnson is that he is a man of such violent contrasts. You know on the one hand, great compassion, great desire throughout his life to help the poor, particularly poor people of color, coupled with this genius for turning that compassion into legislative achievements. And on the other hand, this great cruelty …this great greed … this great arrogance that we will see what happens with Vietnam in the volume that I’m working with now. So when you’re writing about him, as you take each section of his life, you know, you say, “Well, this is just glorious, it’s wonderful, you know.” Then you say, “This is just terrible, it’s horrible”. But it’s my job to portray each as, as it is. HEFFNER: … at the time. CARO: … maybe, maybe I’m not being clear. HEFFNER: No, you’re being very clear, but it seems to me as you put them together, there’s no way of making a good or bad final judgment. 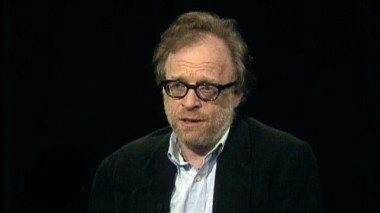 CARO: I, I (laugh) … but you, you, you … I’d rather answer it by saying “Look … you know, look what we see in Lyndon Johnson “. When he was a boy he was working on this road gang, you know, his family was really poor. They lost the Johnson ranch and for the rest of his boyhood, the family really lived in circumstances where they had to worry every month … was their home … their only remaining home … the one in Johnson City, going to be taken away from them. So, he was working on this road gang and it’s really … you know, it’s this vast empty Texas hill country. And in the middle of this … in the midst of this hill country, they’re building this road … it’s not a paved road … they don’t have paved roads in the hill country then … from Austin to Fredricksberg. And there’s a road gang of seven or eight men. And Lyndon Johnson is the youngest … the other’s are really men, in their twenties … Johnson is 17 and 18 years old. And he’s really too skinny to do this work. The older men say, “You know, he was too skinny to do the work”. Buy at lunch hour when they would gather around the fire in the winter when it was freezing cold and they had to work. Or in the blazing hill country sun. He would tell them that “I’m gong to be President of the United States one day”. And he repeated it all his life. He gets to Washington, he falls in with this group of New Dealers … Abe Fortas, Tommy (The Cork) Corcoran, James Rowe (laugh). He’s telling them, “I’m going to be President”. And, you know, even, these men, who … you hear a lot of men in Washington say things like that, saw there was something special about him. They believed he was a man of destiny. But here, in the beginning of this book, we see him make the … he wants to be President all his life … now it’s 1958 … it’s time for him to run for the nomination … the 1960 Democratic nomination. And he doesn’t run. He, he lets Jack Kennedy … this young Senator go around the country and basically take the elect … the nomination away from him. HEFFNER: I don’t want you to stop. HEFFNER: I’m fascinated by your talking and your writing. CARO: Well, they strip him of power. They mock him. They call him “Rufus Cornpone”. You him and Lady Bird … it’s Uncle Cornpone and his little pork chop. He’s ridiculed, humiliated and denied power for almost three years. And, and then in an instant, in the crack of a gunshot in Dallas, everything is changed. And he has the power. And what does he do with it? Great things. So Lyndon … to write about Lyndon Johnson, for me, anyway is really hard because you keep saying “Are you exaggerating on one side, are you exaggerating the other”. You say this was man of very violent contrasts. HEFFNER: … I sudden realized, having read all the volumes thus far … what it was that you were saying and you were saying something that a great historian says, he doesn’t raise to great heights … an individual also has that dark line running through. And that’s when I remembered what you had written … I guess it was in volume two. HEFFNER: You mentioned the word here, in the adjectives you use and the other words you use … humiliation. HEFFNER: Why did that play such a large role? It’s repeated again and again and again in The Passage of Power. CARO: Yeah, well, you picked out a very important word, you know. His boyhood was a time of humiliation … you know a small town can be very cruel. And here you have a small town, Johnson City, that’s cut out, you know, from the rest of the hill country, from the rest of America. Residents of Johnson City at the time used to call it an island city because it’s a little town, something like 382 people, I think, when Johnson was in high school … that’s cut off by a sea of land … and in winter, when the roads are impassable, they can’t … you can’t really get to any place. It’s very hard to get to Austin in one direction, which is an hour … or San Antonio. So it’s a little world unto itself. In this world Lyndon Johnson’s father … from the time he’s born until the time he’s, like, 13 years old, is a great figure. He’s the Representative, the Honorable Sam E. Johnson … he’s a populist legislator, he’s respected. And then in an instant the father makes a mistake … he pays too much to try to buy back the old legendary Johnson ranch … tries desperately to make it pay … and in two years they lose the ranch and he becomes … the father … a figure of ridicule. You know, there are very … at some barbeque … political barbeques … someone says “Sam Johnson’s a smart man, all right, but he’s got no sense”. And everybody laughs and Lyndon’s standing there next to him, when he realizes … if you write about his boyhood … you could cry writing about his boyhood. He’s the only … they go into the, the drug store where they have the penny candies and everyone of the … other kids take out penny candies and they put it on their father’s bill, but Lyndon can’t because his father hasn’t paid his bill. HEFFNER: Humiliation at the hands perhaps of, of Bobby Kennedy because I wanted to ask you … if we’re holding judgments back … you must have some judgment about Bobby. You, you make your reader feel so about Jack less so perhaps, but because of this hate feud between Lyndon Johnson and Bobby Kennedy the feeling is just … I mean here in The Passage of Power you think of Bobby as an extraordinary person in Lyndon Baines Johnson’s life. CARO: Yes. And he’s going to become, you know, in the next volume … I mean the story of the sixties is of Democratic politics and even of some national decisions … hinges a lot on this extraordinary animosity between Robert F. Kennedy and Lyndon Johnson. It’s one of … you know … as a historian you say … one of words … you don’t want to use certain words and one of the words you don’t want to … I don’t want to us … is “hate” … that’s too strong a word. CARO: It is there. Because … I mean … you know … it’s there because it’s not too strong to describe what happens in this book alone between Robert Kennedy and Lyndon Johnson. HEFFNER: … and he did. Why was there such a fight over it? CARO: Johnson has breakfast every morning in, in the Senate cafeteria … Senate dining room which is next door to his office. So the year I, I think is 19 … now I forgot … I think the year is 1953. Robert Kennedy has just joined the McCarthy … Senate Rackets Committee as a Assistant Counsel. So Senator Joe McCarthy has … in the Senate dining room there’s this large round table right near the cashier. And Joe McCarthy always sits at it with his staffers … right. So in this morning there is four or five staffers there and Senator McCarthy and Lyndon Johnson walks in with two of aides … George Reedy, his Press Secretary and Horace Busby, his Speech writer. And they both described the scene to me. That Senator McCarthy jumps up as he always does to every one … you know he’s deferential to Johnson … says “Good morning, leader, you know great job you did yesterday, leader, I don’t know how you pulled that off, leader”. And all his staff jumps up and Johnson goes around, they all shake his hand. One of the staffers doesn’t get up. It’s Robert Kennedy. He sits there sort of glaring at the floor. HEFFNER: Putting out his hand. CARO: … and shake his hand. And I asked, you know, these two Johnson aides who witnessed this … Busby and Reedy … well what was the reason for this … you know? And you say, you know, they gave a number of reasons that Johnson had told stories about Joe Kennedy, Bobby’s father. But they said it wasn’t that. Reedy said to me “Did you ever see two dogs who have never met come into a room and all of a sudden there’s a low growl and the hair stands up on the back of their necks?” He said it was that way whenever they were in a room. These were two men who could not look at each other. HEFFNER: Your, your description of that is, is wonderful. And I guess I didn’t take seriously enough … though I’ve had the experience of the two dogs in the room … of that sort of visceral response between the two of them. Because it led to this extraordinary lifelong battle. HEFFNER: Right. You do say that. Nonetheless, when you map out the events of this afternoon … do you say … but while Robert Kennedy was making these trips, John F. Kennedy was preparing and giving him statement saying “I select Lyndon Johnson”. So to hear about that … you know, you try to talk to as many people as you can who were there. And you say, “What was happening that day?”. It’s such a … I mean the night before John F. Kennedy ends Lyndon Johnson’s dream … he takes the nomination away from him … 806 votes to 409. The next morning at 8:00 o’clock in the morning, the phone rings in Lyndon Johnson’s bedroom. Lady Bird answers and its Jack Kennedy saying he wants to come down and see Lyndon Johnson. And they make an appointment for 10:00 o’clock in the morning … Johnson gets out of bed and calls three men … he three closest aides … Jim Rowe, who is the old Roosevelt New Dealer, great political insider, John Connelly, who was Johnson’s campaign manager in 1960 … because Johnson said, “He’s the only man tough enough to handle Bobby Kennedy” and Bobby Baker who is Lyndon Johnson’s long time aide in, in the Senate. And he says “John Kennedy’s coming down at 10:00 o’clock, what do you think he wants.” And, of course, they all say, “He wants to offer you the Vice Presidency”. And Johnson has them lay out the reasons why he should take it or not take and that he says, “You’re right, I should take it”. And Jack Kennedy comes down and there follows a whole series of things at which nothing definitive is said, but Jack Kennedy comes up and tells everybody “I think he’ll take it”. CARO: … I think, I think … there were three trips … there’s a great difference of description in what happened on each trip. CARO: But a number of things there’s no … so Jack … they’re all in the Biltmore Hotel in Los Angeles, … Jack Kennedy’s suite is 9334 … Lyndon Johnson’s is two floors below in 7334 … and there’s a back stairs. And that’s the back stairs that three times that day Robert Kennedy comes down and he meets with … at one point he meets with … Lady Bird says … because Lady Bird is very wise. And she says basically “Lyndon mustn’t meet with Bobby alone.” And it’s decided … I think the first meeting … it’s been a long time since I wrote this … that he’ll meet with John Connelly and Sam Rayburn. And at this meeting, according to both Rayburn and, and Connelly … Bobby Kennedy says “You know, you don’t have to be on the ticket, Lyndon, you can become Democratic National Chairman”. To which Rayburn replies with a single word expletive … you know. HEFFNER: Not on this air, please. CARO: Not … no, I, I know what show I’m on. (Laughter) I didn’t … you know Rayburn is this mighty … he’s old, you know, and he’s blind … but he’s still a mighty figure, you know. And in another one of these meetings, Robert Kennedy comes down and meets with Rayburn and says, basically that Lyndon should withdraw. And Sam Rayburn says, “Are you … are you authorized to speak for your brother?” And Robert Kennedy says, “No”. And Robert Kennedy basically retreats up the stairs again. And then there’s a third meeting where Robert Kennedy meets with Lyndon Johnson alone and there are two accounts … there are two accounts of this … they’re the only people in the room … are so violently different … that you really don’t know, but you do know that Robert Kennedy was trying to get him to withdraw. And the whole stor … Lyndon Johnson never forgot that day. He never forgot what he calls the humiliation of that day. It was one of the unforgettable, horrible days of his life. CARO: … and Robert tried to get Lyndon to withdraw from it. The relationship of the three of them … you know there are scenes in this book that you could hardly believe. You know, and if you didn’t have a number of witnesses to them, you wouldn’t believe them. HEFFNER: Bringing back that word “humiliation”. CARO: Humil … yes and it was a … you know, it was a humiliation and Johnson is humiliated and he’s driven to, you know, his office is in the Executive Office building. HEFFNER: Again and again he’s asked him … you write. CARO: … well Kennedy won’t do it. So his office is across the street in the Executive Office building. And often he will go over there … it’s painful even to write about and, as … and I think I’m quoting Horace Busby … “wander around the halls, as if to say, “Here I am, give me something to do”. You know just to make himself visible in the White House. And Robert Kennedy … you know … one of the witnesses says, you know, this encounter was completely in Robert Kennedy’s hands … meaning he sort of was enjoying it. And he doesn’t answer it and he sort of retreats. And Lyndon Johnson follows him, begging. There are seen after the scene between these two men that you can hardly believe. HEFFNER: We’re going to … you’re going to sit there and we’re going to pick up when we come back next week. Okay?